As a dance teacher, I get lots of Christmas presents. I also get lots of New Years presents because amidst all the hustle and bustle of the holiday, a number of presents are inevitably forgotten and delivered with sheepish apologies once classes resume. I like getting late presents. It’s like celebrating Christmas twice. Plus it helps out when I’ve forgotten to bring dinner to class like I did on Monday night—at least it’s supposed to. Having been teaching since the age of 14, I’ve gotten pretty good at predicting what my presents will be. Hand lotion is by far the most popular, followed closely by scarves, candles and chocolate covered pretzels. Target gift cards are on the rise, as are fancy hot chocolate sets and mugs (of both the regular and travel varieties). At any rate, I was hungry on Monday night. So when one of my little tap students presented me with a bag of Christmas goodies, I accepted it as graciously as possible and waited until my next class was on its way in before tearing through the wrapping paper. Judging by the size and weight of the package, I was 99% certain it contained chocolate covered pretzels. Boy was I disappointed to discover a pair of aloe-infused socks instead. Not that I wasn’t grateful for the socks—I always love receiving feet-related products, as I do incur some pretty significant damage on Monday and Tuesday nights—but you can’t very well eat aloe-infused socks. At least not in front of your students. Where’s Branson When You Need Him? Hey! 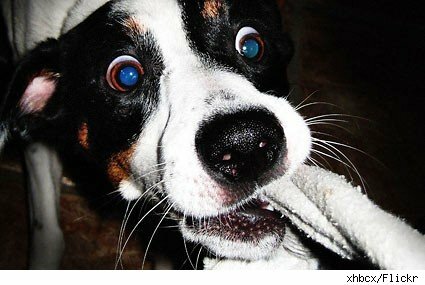 That looks like Beau when I leave my socks on the floor! It’s amazing how quickly one learns to put their socks in 1) the hamper, or 2) on top of something a dog can’t get to. Haha! Lately I’ve been making mega-sock-toys for our dog Dusty. He LOVES them but he tears them apart and leaves half dead socks all over the house. That sounds like a great idea!! I hate buying toys for my dog knowing that he is just going to eat it. What is your process for making ‘mega-sock-toys’? You will love those socks when the blisters erupt as usual!